As a marketer I know how vital it is to execute certain marketing/social activities and up your inbound game by embedding and being mindful of important dates and days of global importance. Not only does it count under good marketing and being responsible as a company celebrating or creating awareness on certain dates, it also does help instill the trust in the stakeholders and raises the brand awareness meter and thus helping in achieving greater reach. Most of the marketers are encountered by the dates in the last minute and end up either doing clumsy marketing or missing the opportunity altogether. As we gear in solidifying our 2019 content marketing plan and creating our editorial calendar, having the dates with you will make it a cake walk to execute the smaller marketing bytes. 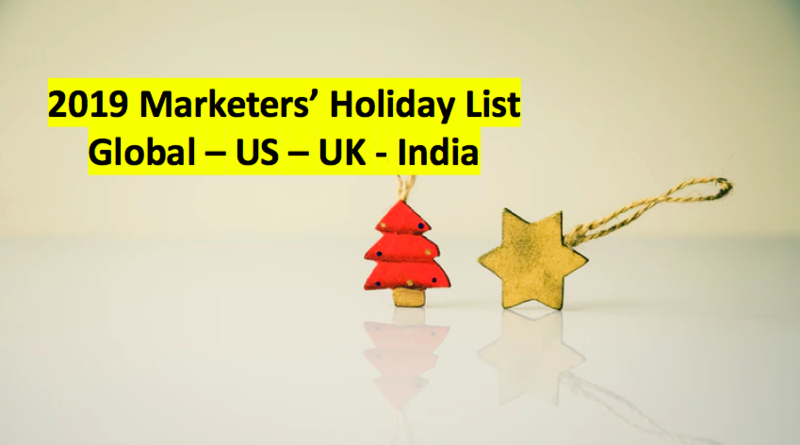 Download the excel sheet of “Marketers holiday list 2019” now and level up your content calendar. Fill in the short form below to download.